"Very easy and delicious appetizer, like a bite-size bloody mary!" Poke 5 or 6 holes with a wooden pick or skewer in each tomato and put in a shallow bowl. Pour vodka over tomatoes. Cover bowl with plastic wrap and marinate until the flavors blend, 1 to 2 hours. 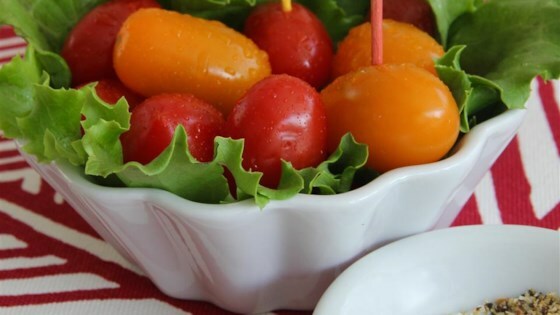 Mix sea salt and lemon pepper in a small bowl; serve with the marinated tomatoes for dipping. Make this all the time but use Bloody Mary vodka to impart a real nice tang! Omg these are great!!! They were gone in seconds. Nobody's laughing at my habenero vodka now. Will definitely make again. Only will double or triple recipe!! I didn’t think the pepper vodka made the cherries as hot as I expected, but they were still pretty tasty. Very tasty. I added some juice from the jar of sport peppers to the vodka when I was infusing it. We also tried bell pepper strips to the marinade. They were good too.